The "great arteries" in this anomaly refer to the Aorta and the Pulmonary Artery, the two major arteries carrying blood away from the heart. 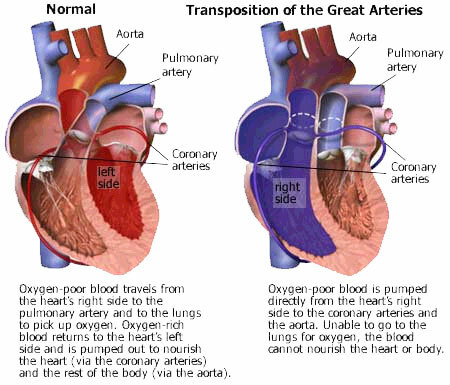 In cases of Transposition of the Great Arteries, these vessels arise from the wrong ventricle. They are "transposed" from their normal position so that the aorta arises from the right ventricle and the pulmonary artery from the left ventricle. About 25 percent of children with Transposition will also have a ventricular septal defect (VSD). In nearly a third, the branching pattern of the coronary arteries as they leave the transposed aorta is unusual. Transposition creates a situation where the systemic (to the body) and pulmonary (to the lungs) circulations are in parallel rather than in series. This means the oxygen-poor blood returning to the right atrium and ventricle is pumped out to the aorta and back to the body, while the oxygen-rich blood returning form the lungs to the left atrium and ventricle is sent back to the lungs via the pulmonary artery. Unless there is some place in the circulation where the oxygenated and unoxygenated blood can mix, all of the organs of the body will be deprived of necessary oxygen. In the case of a child who has a ventricular septal defect, this hole may allow enough mixing to maintain oxygen levels in the body at a safe range.